We took the ups and the downs together and, I think because we had each other, we helped each other from going crazy or having nervous breakdowns. Unlike poor old Elvis, who, although he had 59 friends with him, was not the same. He was the only one who experienced what it was like being Elvis, whereas four of us experienced what it was like being fab. When the Beatles broke up, Paul McCartney had a good marriage and an adopted daughter and eventually four biological children of his own. When his wife died he soon was married to another woman and then when that marriage ended he married another one whom he remains married to at the present time. So I doubt there have been many people who ever lived who have been less lonely than Paul McCartney. And yet, thanks to his artistic imagination, McCartney wrote at least two great songs about loneliness. No More Lonely Nights is a favorite of mine, released in 1984, when McCartney was 42, into the fifteenth year of his marriage with a house full of children. But he's singing about having no more lonely nights. Allison Krauss did a nice cover version. 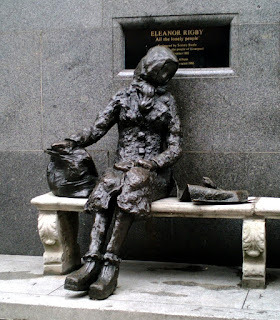 More famous and more amazing though is Eleanor Rigby. He wrote this song about middle-aged loneliness when he was twenty-freaking-four years old, in the middle of Beatlemania. The song was justly celebrated right from the get-go and covered by everybody from Aretha Franklin to Alice Cooper. McCartney wrote the first verse by himself, and the Beatles finished the song in the music room of John Lennon's home at Kenwood. John Lennon, George Harrison, Ringo Starr, and their friend Pete Shotton all listened to McCartney play his song through and contributed ideas. Harrison came up with the "Ah, look at all the lonely people" hook. Starr contributed the line "writing the words of a sermon that no one will hear" and suggested making "Father McCartney" darn his socks, which McCartney liked. It was then that Shotton suggested that McCartney change the name of the priest, in case listeners mistook the fictional character in the song for McCartney's own father. McCartney could not decide how to end the song, and Shotton finally suggested that the two lonely people come together too late as Father McKenzie conducts Eleanor Rigby's funeral. At the time, Lennon rejected the idea out of hand, but McCartney said nothing and used the idea to finish off the song, later acknowledging Shotton's help. Lennon was quoted in 1971 as having said that he "wrote a good half of the lyrics or more" and in 1980 claimed that he wrote all but the first verse, but Shotton (who was Lennon's childhood friend) remembered Lennon's contribution as being "absolutely nil". McCartney said that "John helped me on a few words but I'd put it down 80–20 to me, something like that." Here is McCartney performing Eleanor Rigby in 1984 (same year he released No More Lonely Nights, coincidentally.) Even though by then he was past the incredible beauty of his youth he's still a fine looking man who really rocks a tux.